GUJCET Syllabus 2017 (गुजरात सीईटी सिलेबस, परीक्षा पैटर्न): The aspirants who are interested in getting admission in engineering and pharmacy in the state of Gujarat can apply for the Gujarat common entrance test. Students are advised to start their preparation for the GUJCET 2017. The syllabus for the exam has been updated and aspirants can check GUJCET 2017 syllabus on the official website. The aspirants who are going to appear in the GUJCET 2017 exam, they must start their preparation according to the GUJCET syllabus and exam pattern. With the help of Sample Papers and Exam Pattern of Gujarat CET 2017, candidates will be able to prepare all the topics according to the marking scheme of the GUJCET. If the aspirants prepare according to the syllabus they will be able to prepare for the exam in a better way as well as they will score excellent marks in the exam. The aspirants applied for the GUJCET 2017 engineering and pharmacy courses can prepare for the exam topic wise. With the help of the GUJCET 2017 syllabus, they will be able to prepare in an excellent manner as well as they can score higher in the exam. The GUJCET 2017 syllabus for the engineering and pharmacy exam is divided into four parts and they are given below. The aspirants who are preparing for the GUJ CET 2017 will require the exam pattern for the exam. According to the GUJ CET 2017 Exam Pattern, for engineering and pharmacy, 120 question will be asked in the exam respectively. Each portion will carry 40 marks for both engineering and pharmacy. The time duration for the exam will be three hours for engineering and pharmacy respectively. The sample paper for GUJ CET 2017 are made for the aspirants to practice as the examination format and the sample papers are just similar to the actual exam pattern. The GUJCET 2017 Sample paper will cover the Mathematics, Physics and Chemistry for the B.Tech exam and Chemistry, Physics, and Biology for Pharmacy courses. Aspirants must have a habit of solving sample paper, by solving and continuous practice they will be able to score well in the GUJCET exam. GUJCET 2017 Model Test Paper are available on the official website of Gujarat Common Entrance Examination, aspirants can download the model/sample papers and can start preparing for the exam. The Gujarat Common Entrance Test will be conducted on 11th May 2017 and students must start preparing for that exam. For the better preparation for the exam, students will require the exam syllabus and the GUJ CET 2017 Syllabus is available on the official website of the Gujarat education board. The students are also advised to check the Exam pattern of the GUJCET 2017 so that they will get an idea about the exam and will be able to prepare according to it. 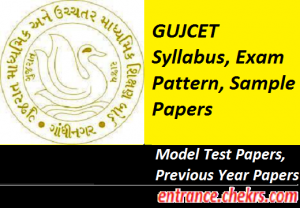 The GUJ CET 2017 Exam Pattern has explained above in the article. For more information regarding the GUJ CET Syllabus 2017, aspirants can contact us by commenting in the comment section given below.